Handmade Sanganeri Royal Look Bedspread 100% Cotton Bed Spread. Fabric - Pure Cotton. SIZE:- 82 55 Color - Multi Color. Add an ethnic feel to your room with this cotton handmade wall hanging. A must have in any season for all ethnic savvy ones. This gorgeous piece of art can be used as Bedspread, Bed Cover, Table Cloth, and Curtain and of course as a Tapestry or a Wall Hanging. Tapestry Mandala Decor Hippie Indian Bohemian Wall Hanging 100% Cotton. we assure you that we will resolve any kind of issue or concern you may leave. A beautifulBedspread or Coverlet. This astonishing tapestry or tablecloth highlights aCeltic dragon inshades of blue with Celtic knots all over on a beautiful Celtic knot border. This tapestry can also be used as acoverlet orbedspread. Tapestry Mandala Decor 100%Cotton Indian Handmade. 100% Cotton - these tapestries are printed, not quilted or woven. They are hippie Indian tapestries. Thin as sheet. Each tapestry has its unique imperfections. This gorgeous piece of art can be used as Bedspread, Bed Cover, Table Cloth, and Curtain and of course as a Tapestry or a Wall Hanging. Item - Tapestry. Washing- Dry Clean or Machine Wash Cold. Material - 100% Cotton. Give us a chance. We follow WYSIWYG "What you see is what you get". The details of the products or product specifications (for instance weight, color, handwork details, size, etc.) quoted with the product displays are only fairly accurate values. One Giant Pearl/Silver Sequins Dragon Extra Large Tapestry wallhangingW68"xH37"
Adorned with yellow gold threads, Pearl/Silver Disc sequins, Velvet and beads. ONE PEARL EMBROIDERED DRAGON. ONE SILVER DISC DRAGON. - It made from silk, Velvet and Fabric. The item's color might be slightly different from the picture. Indian Mandala Tapestry Thin Cotton Fabric Tapestries (Handmade In India). Our products create magic everywhere by enhancing any location whether it is the garden, kitchen, bedroom, drawing room or the terrace. Indian Mandala Tapestry Thin Cotton Fabric Tapestries (Handmade in India). Beach Spread, Bed Spread. These Indian bedspread tapestries are handmade in India, these are100% cotton fabrics. Our products create magic everywhere by enhancing any location whether it is the garden, kitchen, bedroom, drawing room or the terrace. Design: - Amitus Exports(TM) Premium Quality 1 X Tiger Dragon Tie Dye Multi-Color 79"x53"(Approx.). Our products create magic everywhere by enhancing any location whether it is the garden, kitchen, bedroom, drawing room or the terrace. 100% Cotton - This tapestries are printed, not quilted or woven. They are hippie Indian tapestries. Thin as sheet. Good, tight power loom construction. This gorgeous piece of art can be used as Bedspread, Bed Cover, Table Cloth, Curtain and of course as a Tapestry or a Wall Hanging. Single Silver Sequins Dragon Red/Black BG Small Tapestry wall hanging W28"xH22"
Single Silver Sequins Dragon Red/Black Velvet Red/Brown Silk Border Small Tapestry wall hanging W28"xH22". - Adorned with yellow gold threads,Silver Disc sequins, Red/Black Velvet and beads. - It made from silk, Velvet and Fabric. 100% Cotton - This tapestries are printed, not quilted or woven. They are hippie Indian tapestries. Thin as sheet. Good, tight power loom construction. This beautiful item can also be hung as a tapestry on the wall to decorate any room multi color, Warmth, Design, culture and Style.! One Pearl Dragon Small Blue Velvet Handmade tapestry wall hanging W28"xH22"
W28" x H22" approx. - Adorned with yellow gold threads, Pearl Embroidery, Blue Velvet and beads. - It made from silk, Velvet and Fabric. ONE PEARL DREAGON. The item's color might be slightly different from the picture. Add an ethnic feel to your room with this cotton handmade wall hanging. A must have in any season for all ethnic savvy ones. 100% Cotton - these tapestries are printed, not quilted or woven. They are hippie Indian tapestries. This gorgeous piece of art can be used as Bedspread, Bed Cover, Table Cloth, and Curtain and of course as a Tapestry or a Wall Hanging. Add an ethnic feel to your room with this cotton handmade wall hanging. Product - Wall Hanging Tapestry. Print - Screen Print. Material - Cotton. Since most of the products have intricate handwork, there may be slight variation in the pictures displayed and the respective actual products. A beautifulBedspread or Coverlet. 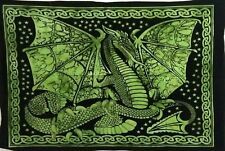 This astonishing tapestry or tablecloth highlights aCeltic dragon inshades of green with Celtic knots all over on a beautiful Celtic knot border. This tapestry can also be used as acoverlet orbedspread. A beautifulBedspread or Coverlet. Thisastonishing tapestry or tablecloth highlights a Celtic dragon inshades ofred withCeltic knots all over on a beautiful Celtic knot border. This tapestry can also be used as acoverlet orbedspread. Item - Twin Wall Hanging / Tapestry / Bed Cover. Wall Hanging. Bed Cover. Material - 100% Cotton Fabric. Coverlet Or Sofa Cover. Usage - Bedspread. Table Cloth .